Me? I’ve been house/cat-sitting up in the middle of Vermont, and taking daily morning walks before I then hunch low over a desk all day. It makes it all worth it. Well, and making comics every day makes it all worth it. And cookies. Hey, nice that the Anna Galactic Kickstarter made it! Also, I was a bit bummed when the One Way KS didn’t make the cut so the option to buy that book is also very nice. Thank you for the brilliant comics. Spacetrawler especially feels like somebody’s RPG campaign. Also, a question about Anna Galactic: have you read the Webcomics Handbook by Brad Guigar (or maybe even otherwise talked to him)? I read it and it says the same thing you did in Anna Galactic: do not try to make forced pages as for a printed publication when you’re publishing (first) on the web. Will you post a picture of the cat you’ve been sitting with? @Pare, I have read that book. And yeah, it was a fun experiment. Although I am enjoying getting back to the “one size with punchline” format, maybe because of my doing daily comics for a decade. So good to be back in familiar territory since that was where I first started reading your work, Christopher. Nice of the king to let them go rogue and suspend their life insurance policy too. Rogues can’t be still on the payroll or it looks bad. I still love it how once King became head of GOB we mostly see him, well, his slightly showing forehead and a few tentacle tips really, behind his not very big box of a desk, somewhere in a far and nearly forgotten corner of a bureaucratic oblivion, a GOB equivalent of a steam room really. ???? Fuuuuuck yeah! 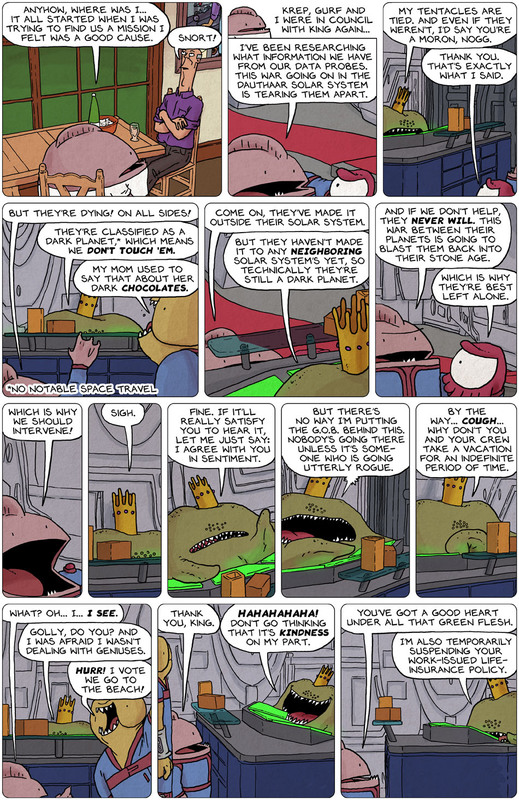 Spacetrawler is back, baby! Panel 5, “Solar system’s” should be the simple plural “solar systems”. … and Stewart noted days later that it should be “star systems”. I gotta up my game beyond spelling and grammar errors.